Preheat the oven to 400 F. Prepare a baking sheet lined with foil. 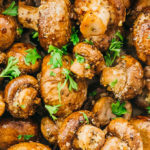 In a large mixing bowl, toss mushrooms, garlic, olive oil, oregano, salt, and pepper until well-mixed. Spread them out in a single layer on the baking sheet. Drizzle balsamic vinegar on top of the mushrooms, and toss or flip the mushrooms. Evenly sprinkle parmesan cheese on top of them. Bake for another 10 minutes, or until the mushrooms are tender and the balsamic vinegar looks “baked in.” It’s fine if some of the balsamic vinegar on the foil starts to blacken. Top with chopped fresh parsley, and serve. This recipe yields 8 g net carbs per serving (1/3 of the recipe).